WASHINGTON — Congress on Thursday passed a stopgap spending bill to prevent a government shutdown this weekend and buy time for challenging talks on a wide range of unfinished business on Capitol Hill. The shutdown reprieve came as all sides issued optimistic takes on an afternoon White House meeting between top congressional leaders and President Donald Trump. The measure passed the House 235-193, mostly along party lines, and breezed through the Senate on a sweeping 81-14 tally barely an hour later. 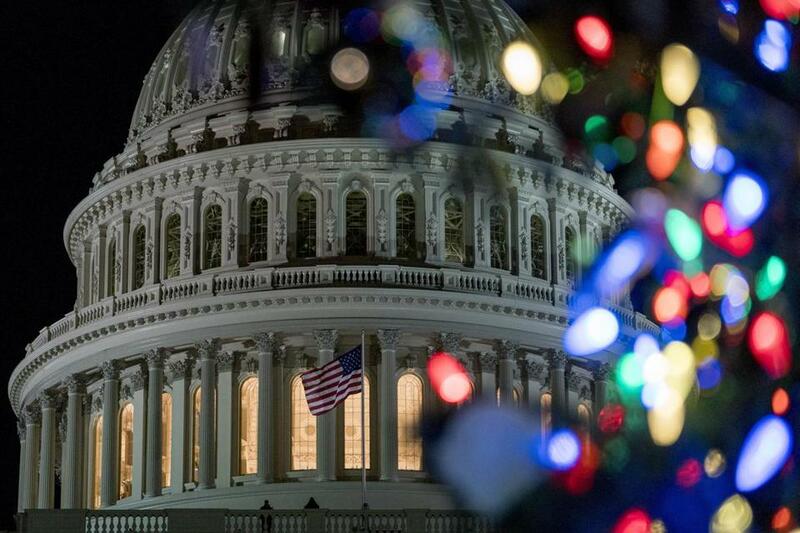 It would keep the government running through Dec. 22, when another, and more difficult, shutdown problem awaits. The bill now heads to Trump for his signature. Topics at the White House session included relief from a budget freeze on the Pentagon and domestic agencies, extending a key children’s health program and aid to hurricane-slammed Puerto Rico, Texas and Florida. The trickiest topic, and a top priority for Democrats, involves protections for immigrants brought to the country illegally as children. These ‘‘Dreamer’’ immigrants are viewed sympathetically by the public and most lawmakers but face deportation in a few months because Trump reversed administrative protections provided to them by former President Barack Obama. ‘‘We had a productive conversation on a wide variety of issues. Nothing specific has been agreed to, but discussions continue,’’ said Capitol Hill’s top Democrats, Sen. Chuck Schumer of New York and Rep. Nancy Pelosi of California, ticking off a roster of Democratic priorities, including domestic spending increases, funding for veterans and money to battle opioid abuse, immigration and health care. GOP leaders said they agreed with the need to address immigration, including the almost 1 million immigrants given protections by Obama, many of whom have only known America as their home. Negotiations are sure to be challenging. Pelosi staked out a hard line Thursday and insisted that any year-end deal solve the immigration issue. Pelosi told reporters before the meeting that ‘‘we will not leave here’’ without helping the ‘‘Dreamers.’’ Her stance was noteworthy because GOP leaders are likely to require Democratic votes for the pre-Christmas spending bill. The White House said ‘‘negotiations on immigration should be held separately on a different track’’ and not slow down funding increases for the Pentagon. Pelosi returned from the White House to oppose Thursday’s stopgap bill. Fourteen Democrats supported the measure, however, while 18 Republicans opposed it. Meadows said they’d help it pass to avoid distractions from the GOP drive to push their treasured $1.5 trillion tax bill through Congress this month. That measure, which mostly benefits businesses and upper-income people, is Trump’s and the GOP’s top remaining priority and would be their first major legislative triumph of the year. Last week, an unexpected attack by Trump on Schumer and Pelosi prompted the two to skip a bargaining session. The two-week spending bill also makes money available to several states that are running out of funds for the Children’s Health Insurance Program, known as CHIP. That widely popular program provides medical care to more than 8 million children. The CHIP issue is among the year-end items where negotiations have gone positively, and aides say a long-term agreement is nearly in hand.